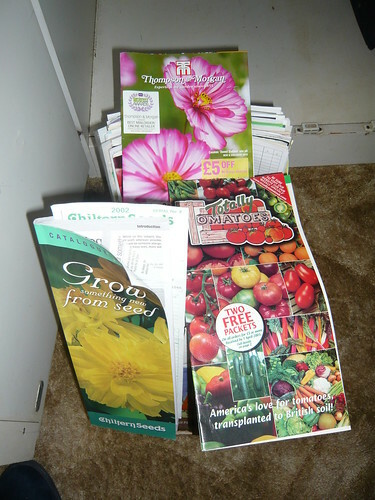 The seed catalogue season is in full swing and I paused to consider their value to gardeners. Good catalogues contain lots of information in an accessible and digestible form. Photographs of ‘best in class’ purport to show what will result from sowing and growing the seeds. Given poetic license for a bit of photoshopping and retouching you can get a fairish idea of what to expect. Many catalogues have extensive selections often with new varieties thrown in. A new trend with catalogues has a ‘Marmite’ appeal as plug plants, grafts, equipment, shrubs and other offers now often take up more space than seeds. The best reason I can find is the browsing facility that you can do from your own armchair. It beats standing at racks in garden centers. All the glossy printing and expensive photography has to come from gardeners pockets in some shape or form. Too many copies are distributed, I have had 3 catalogues from Dobies (Owned by Tesco who also own Suttons seeds) with minor differences in content or cover and there is still the cost of postage and distribution. Prices and thus value seem to have drifted adversly over the last few years. No more so than reduced packet quantity, postage or minimum order price. Seed packets designed for retail display are not cheap and to compensate the number of seeds is often very sparse. It is worth considering buying plants rather than risk low germination and seed packet yield. Branding and marketing are now significant costs for most companies and we customers pay. Another good reason for grow your own and save good seed. ‘Wallis Seeds are a small family run business and have been selling seeds for over 30 years. Their aim is to provide good quality seed, in good quantities, at a good price. The packets do not have expensive colour pictures!’ The mono colour catalogue seems to have been discontinued but the supply of seed by weight and or varied quantities is still an economic plus. I have kept my old catalogue for reference as basics do not change all that rapidly. Please do not forget Thompson & Morgan whose sales from this site provide a small commission to help defray our costs. Marshalls and Unwins are brands both owned by Westland. Mr Fothergill’s also owns DT Brown, Woolman’s, The Sweet Pea Company and Johnsons but I don’t know who owns them. One way or another we are all paying for the seed trade and their profits. Dow, Monsanto, Bayer, Basf, Dupont and Syngenta are major chemical conglomerates that supply agriculture. Japanese companies are growing market share. The “Big 6” have entered into a number of agreements to share patented, genetically engineered seed traits with each other, such as herbicide tolerance and expression of insecticidal toxins.as the businesses within the industry consolidate.